Rex Heflin, an Orange County highway inspector, was at work in a county vehicle at 12:37 P.M when he saw a hat-shaped (disc with dome) object hovering above the road. He grabbed his Polaroid camera and took three photographs of the metallic-appearing object and a fourth of a black "smoke ring" left behind by the object. Rex Heflin, an Orange County highway inspector, was at work in a county vehicle at 12:37 P.M when he saw a hat-shaped (disc with dome) object hovering above the road. He grabbed his Polaroid camera normally used to record highway obstructions or other problems and took three photographs of the metallic-appearing object and a fourth of a black "smoke ring" left behind by the object after it departed at high speed. He reported seeing a rotating band of light on the underside of the object (like the sweep of a radar beam). Heflin twice tried to radio his base, during the sighting, but the radio would not work. (It functioned normally after the object departed.) One of the photographs was published by the Santa Ana Register on September 20, 1965; then the story was picked up by the national newswire services. The Los Angeles Subcommittee of NICAP, headed by Idabel Epperson, conducted a thorough investigation of the case, including a detailed character and background check, on-site investigation and measurements (by engineer John Gray), and photoanalysis. Both Heflin and the newspaper cooperated fully in the investigation. Computer enhancement and photoanalysis was conducted by Robert Nathan at the Jet Propulsion Laboratory, working with first-generation prints and copy negatives made by the newspaper. Among other things, the analysis established photographic evidence to confirm the "light beam" on the underside of the object. 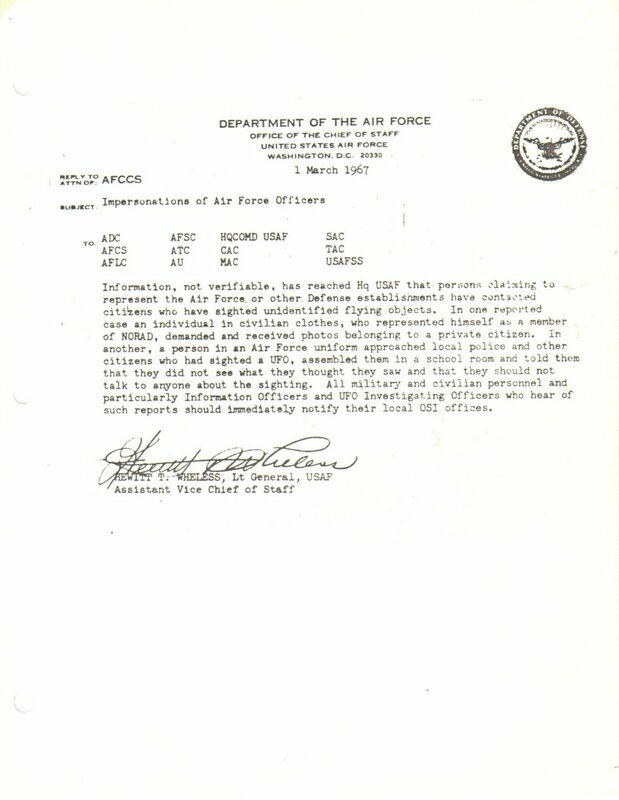 The Air Force issued a statement declaring the photographs a hoax, which was strongly disputed by NICAP. Nathan specifically ruled out a model suspended by a string as the explanation. Unknown parties later attempted to tamper with the evidence and manipulate information. The copy negatives were obtained from Heflin under false pretenses, by someone pretending to be from the North American Air Defense Command. (Click here for copy of letter from Lt. Gen. Wheless). Years later, Bill Spaulding of Ground Saucer Watch using computer enhancement techniques reported finding a line-like marking above the object, suggestive of a supporting string, implying that the UFO was hoaxed by using a small model. However, the alleged "line" clearly was either an artifact created by multigenerational copying of the photographs or a deliberately introduced marking to discredit Heflin. No such line was found in the originals by Nathan, the newspaper, or NICAP analysts. In 1993, MUFON photoanalyst Jeffrey Sainio re-examined Spaulding's work and rejected the string hypothesis. 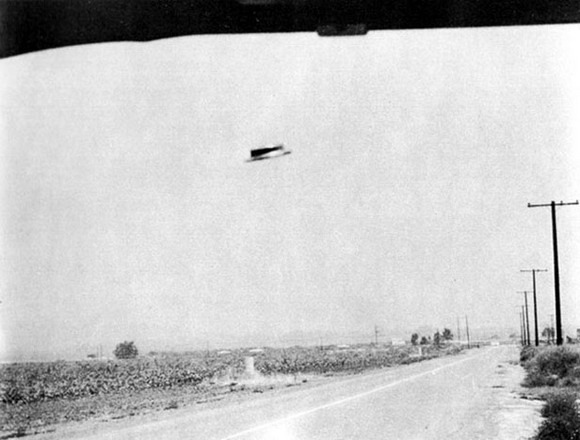 At noon on August 3, 1965 highway traffic engineer Rex Heflin was driving near the Santa Ana freeway when he saw a UFO. He stopped and snapped three Polaroid shots of it. He reckoned it was 750ft (225m) away, at an altitude of 150ft (45m), and 30ft (9m) in diameter. Although Heflin did not report the sighting, on 20 September the Santa Ana Register published the photos. "Rex Heflin is a Highway Accident Investigator for the Los Angeles County Highway Commission... he carried a Polaroid camera...[which] contained film rated at 3000 ASA... [On] Myford Road near Santa Ana... he spotted an unusual object approaching the road. 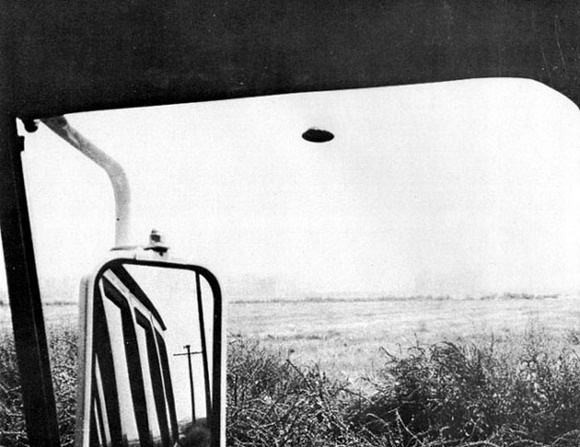 He stopped the truck, grabbed the camera off the seat beside him and made three pictures as rapidly as possible... As the object moved away, Heflin... scrambled out of the truck and took his fourth and final picture... Heflin tried to contact his office by radio while the UFO was near [his vehicle], [but] the radio refused to operate." The radio operated correctly again after the object's departure. Heflin had a Polaroid camera because he normally used it to record highway obstructions or other problems. Unknown parties attempted to tamper with the evidence and manipulate information. The copy negatives were obtained from Heflin under false pretences, by someone pretending to be from the North American Air Defense Command. Years later, Bill Spaulding of Ground Saucer Watch using computer enhancement techniques reported finding a line-like marking above the object, suggestive of a supporting string, implying that the UFO was hoaxed by using a small model.